“The teachers’ demands are simple: more money for them and their classrooms and more respect for a profession blamed for a range of ills. 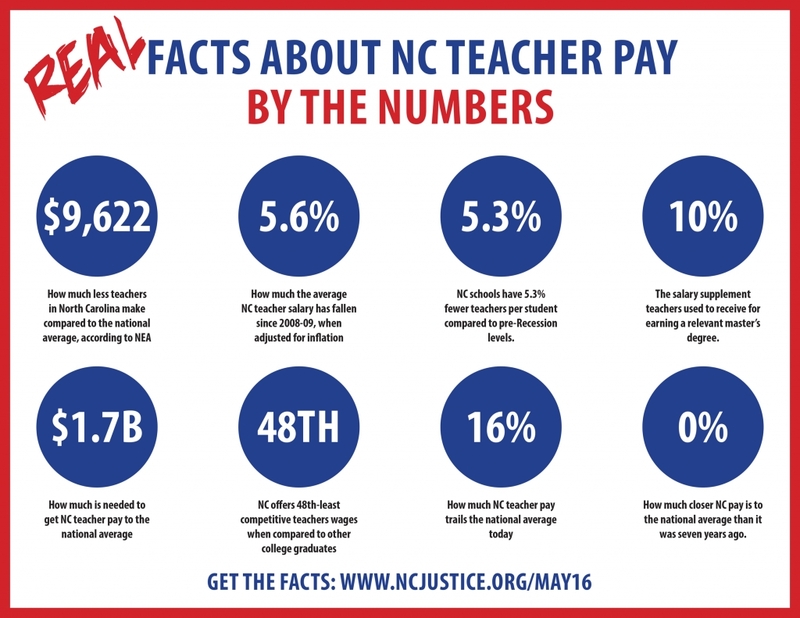 The facts are these: The average pay for teachers in North Carolina is $51,214. That ranks 39th out of 50 states and the District of Columbia. That average has gained eight spots since 2013, and public school teachers are paid better than a lot of North Carolinians. But the typical N.C. teacher is paid nearly $10,000 less than the national average. Among professions that require a four-year degree, teaching is one of the lowest-paid careers that a college graduate can pick. Because the cost of living has gone up much faster than teachers’ salaries, the typical N.C. teacher has about $5,000 less in purchasing power than a decade ago, before the Great Recession. The recent salary increases have made up some ground, but there is still a long way to go. There’s more. In recent years, Republican lawmakers took away longevity bonuses paid to veteran teachers and stopped offering higher salaries to teachers with advanced degrees. The legislature also did away with multiyear teaching contracts for newly hired teachers. Teachers want these perks restored. The answer, according to the editorial begins with Republicans not pretending like the problem has been solved. “Republican leaders in Raleigh are trying to hold back this sea of red. They point out that they will raise teachers’ pay this year for the fifth consecutive year. (Their proposed 6.2 percent raise would move the average to $53,600.) At a news conference Tuesday, GOP leaders said they’re thinking about awarding bonuses to top teachers or those who teach high-demand subjects. Gov. Roy Cooper, a Democrat, has a better plan. The budget proposal that he unveiled last week would increase salaries by 8 percent this year and take a big first step toward the national average. (Republicans say it will cost too much to get N.C. teachers to the national average.) Cooper would pay for these increases by holding off on a planned tax cut for businesses and for people making more than $200,000 a year. Even as GOP leaders were praising themselves for supporting teachers, they couldn’t resist talking out of turn. One Republican lawmaker said before Wednesday’s event that “union thugs” were behind the rally. On the eve of the rally Senate President Pro Tem Phil Berger said he was disappointed that “a million kids are not going to be in school (Wednesday) because a political organization wants to have folks come here to communicate with us or send a message or whatever.